It's good to have a party excuse letter handy. Turns out, I didn't much need mine, because our inclement weather caused so many cancellations. It's a good writing project though. Write an outlandish excuse for why you can't do or attend something you really don't want to do or attend in the first place. 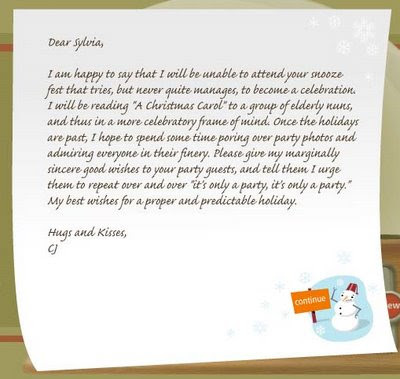 You can also enjoy the festive atmosphere over at the Holiday Excuse Generator. Nice letter template! How do you get it? Doctors note: I included the link at the bottom of the posting.